Public awareness of how germs are transmitted from person to person has popularized the use of antibacterial wipes and dispensers which help prevent the spread of germs. Antibacterial wipes are utilized to clean and sanitize nonporous surfaces which have been proven to be essential for preventing the spread of germs and controlling dust. They are commonly utilized in high and low traffic areas, in private and public facilities, such as airports, train stations, bus depots, restrooms, nursery schools, food service facilities, health clubs, spas, doctors’ offices, laboratories, physical therapy centers, hair, nail and tanning salons, retail stores, hospitals, assisted living centers, offices, manufacturing plants, cruise ships, gyms, and supermarkets. By strategically placing the Antibacterial Wipe dispensers in the most convenient, easy to find, locations, they will be noticed and used more frequently. Employees and visitors value efforts to create a healthier environment with less risk of cross contamination. Antibacterial wipes are sold separately from the dispensing units and are available in rolls of 900 each 8” x 6” FDA approved wet wipes. Glaro antibacterial sanitizing wipes may be purchased in a case of two rolls (1800 wipes) or a case of four rolls (3600 wipes). Directions for use and a summary of active ingredients are available. These ammonia-free, bleach-free, deodorizing antibacterial wipes and towelettes can be used on washable, nonporous surfaces and hands. The wipes formula includes water, alcohol and aloe. Glaro’s wipes will kill 99.9% of common germs. Surfaces with bodily fluids should be cleaned before the use of an antibacterial wipe and then allowed to air dry. Glaro wipes are absorbent and, therefore, excellent for cleaning soiled equipment, objects, and surfaces. For badly soiled surfaces, a second wipe is recommended for better sanitizing. 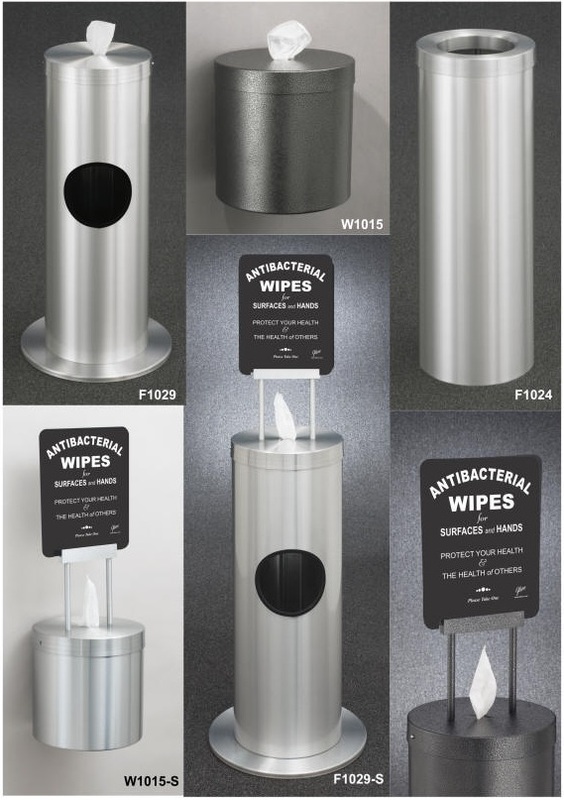 This family of contemporary designed products includes a floor standing combination wipe dispenser and waste receptacle that features a top compartment for wipes and a side opening for conveniently discarding used wipes. The wall mounted antibacterial wipes dispenser holds the same full size roll of 900 wet wipes (also known as “gym wipes”) which can be mounted on walls, columns, or fixtures. All dispensing units for the antibacterial wipes are available with and without an attractive silk screened sign on a handsome sintra panel to encourage use of the wipes. A matching floor standing funnel top waste receptacle is designed to fit under the wall mounted unit or for use anywhere to accommodate a larger volume of waste. Several additional round and half round matching receptacles in a variety of sizes and designs are offered so that facilities may provide additional general waste disposal coverage at multiple locations. Glaro is pleased to help create the message of your choice and apply a logo to the top or side of the unit to enhance branding and encourage use of the wipes to promote a safer, more germ free environment. Built to last for years, our seasoned Glaro design team and craftsmen have produced a sturdy, durable, and attractive line of functional products using fire-proof heavy gauge aluminum and steel with tough finishes that are easy to maintain. The Glaro Antibacterial Wipe Dispensers and Waste Receptacles are among the most attractive in the industry. Their sleek design features a touchless dispenser with a neat “x”-shaped opening that allows only one wipe to be dispensed with each pull. The finishes offered can be matched or coordinated with any existing nearby furniture and fixtures such as umbrella stands, recycling receptacles, clothes racks and coat hooks, sign stands, bellman carts, and other items or finishes in the building. This allows a facility to create a customized professional look. Glaro’s Antibacterial Wipe Dispensers and Waste Receptacles feature a heavy weighted base for added stability. A unique double push-button mechanism keeps the cover secured to the body while wipes are pulled one at a time. It’s easy to depress the two push buttons on either side of the top cover and to lift off the top when it’s time to refill with additional wipes. When done, the cover snaps back into place. To empty the waste compartment, lift the body off the base section to access the inner bucket. After emptying the trash bucket inside, slide the body back on the weighted base unit. No inner poly bag is needed. Glaro offers the Antibacterial Wipe line of products in 3 finishes. Solid aluminum models are available with a fine satin polished finish (SA) with a clear baked powder coating that will not show finger prints or streaks. Galvanized steel models are available in smooth Satin Black (BK) or textured Silver Vein (SV). Additional Glaro standard finishes are available for special requests. Trained Glaro staff is always ready to provide customers with information on the Antibacterial Wipe Dispensers and receptacles. They are sincerely interested in distributor product requirements. As with all Glaro Inc. products, the Antibacterial Wipe Dispenser and Waste Receptacle line is known for its quick shipping time. Speed of shipment is a top priority. Freight is handled by performance rated transporters with a proven record for safe on time delivery at competitive prices. Since 1945, Glaro has built a reputation for quality, attractive, functional, durable, and versatile products that last for years and years. All products manufactured by Glaro Incorporated are manufactured in the USA. They provide quality, dependability, and meet the highest standards of environmental sensitivity and responsibility. Durable Satin Aluminum finish, Satin Black baked smooth powder coat finish, Silver Vein baked textured powder coat finish or 27 designer powder coat finishes.